As the Scopes ‘Monkey’ Trial came to an end in July 1925, William Jennings Bryan expected to deliver the prosecution’s closing argument. Procedural tactics by the defence prevented this. The trial ended without the long-awaited climatic moment in front of the world’s media. Five days later, unexpectedly, Bryan died. 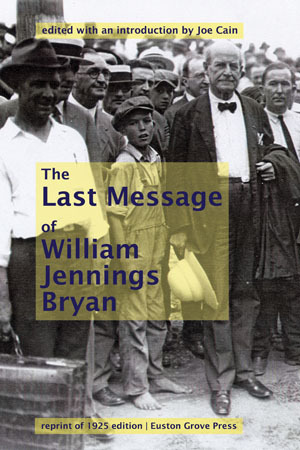 In their bereavement, supporters focused on Bryan’s unspoken words as their last chance to connect with the Great Commoner. A local newspaper editor gave Bryan’s text a quick polish, then saw to its speedy publication. This volume reprints that 1925 material in its entirety, together with a brief historical introduction.